M.P.E.C. 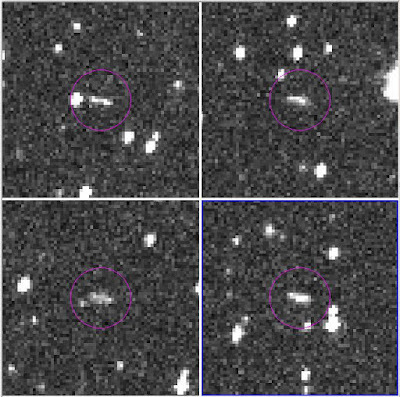 2018-L04 issued on 2018 June 3 at 16:15 UT reports the discovery of the asteroid 2018 LA (discovery magnitude 18.2) by Mt. 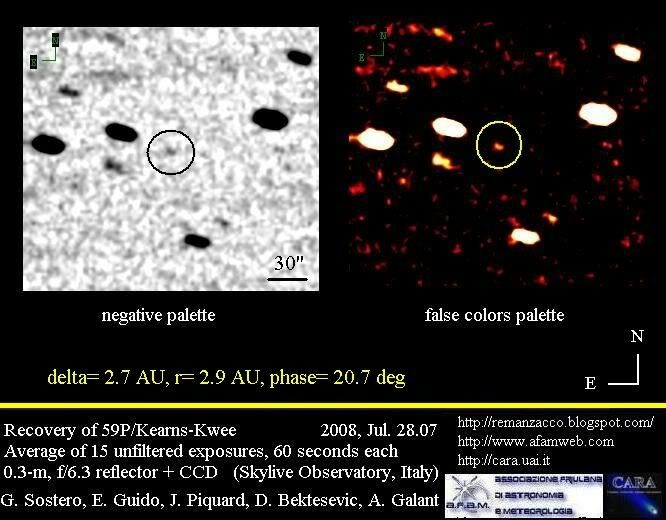 Lemmon Survey (MPC code G96 - Observer R. A. Kowalski) on images taken on June 02.3 with a 1.5-m reflector + 10K CCD. 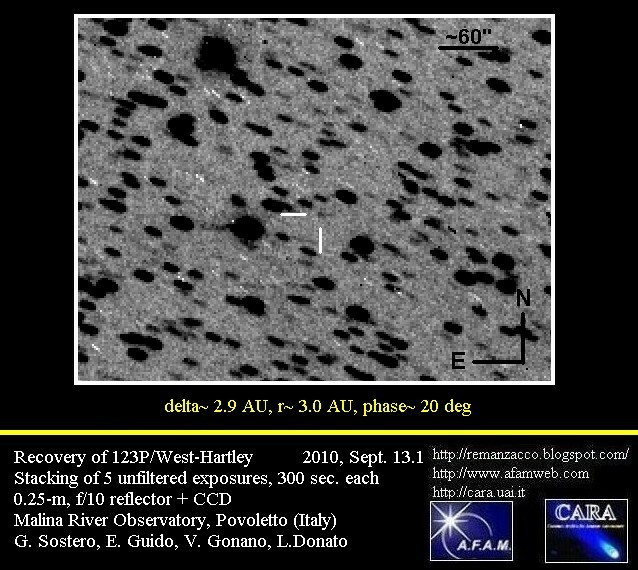 2018 LA is a small Apollo asteroid with an estimated size of 1.7 m - 5.2 m (based on the object's absolute magnitude H=30.6). 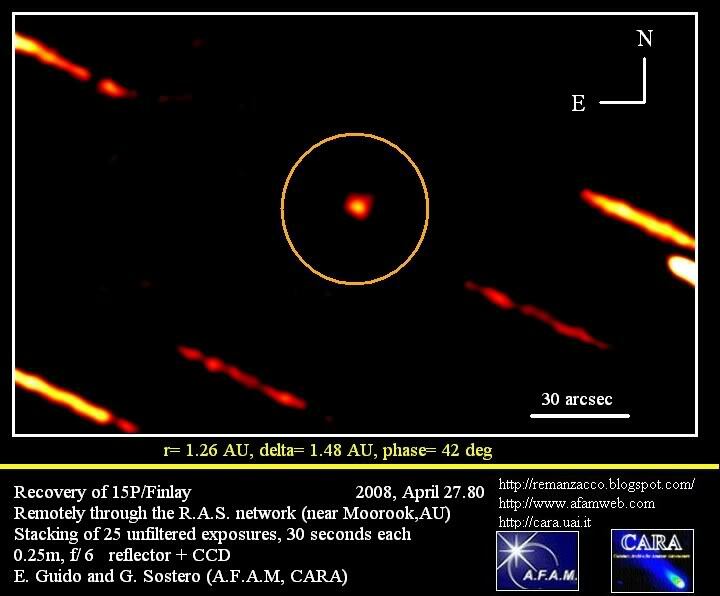 "This object no longer exists (in its original form), following its entry into the Earth's atmosphere on 2018 June 2. 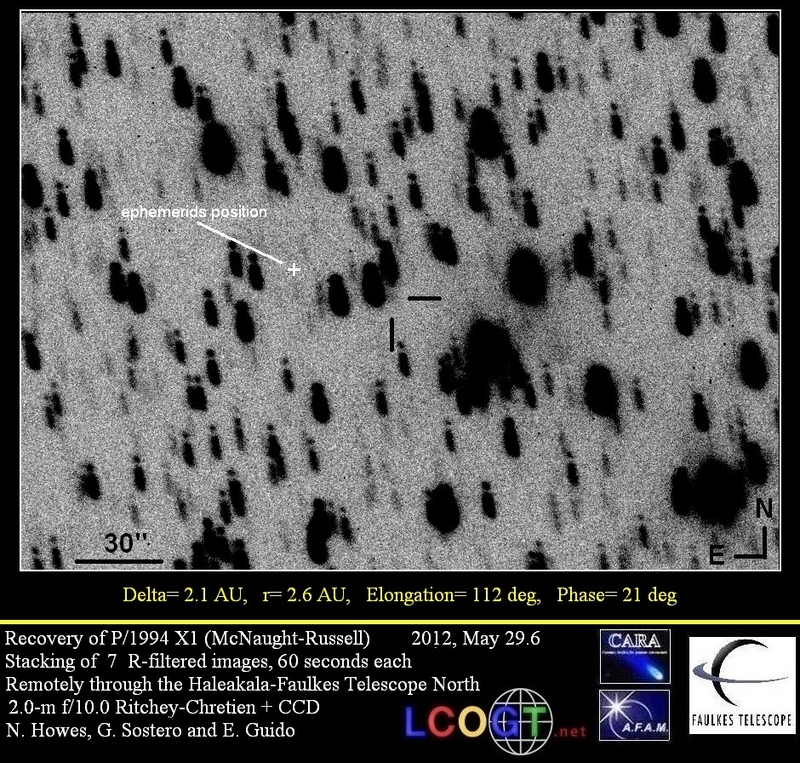 A news item on the event is in preparation by JPL's Center for Near-Earth Object Studies. The orbit below, based on only the given astrometric observations, indicates that the object reached 50-km height above the Earth's surface around 16:51 UTC over southern Africa". 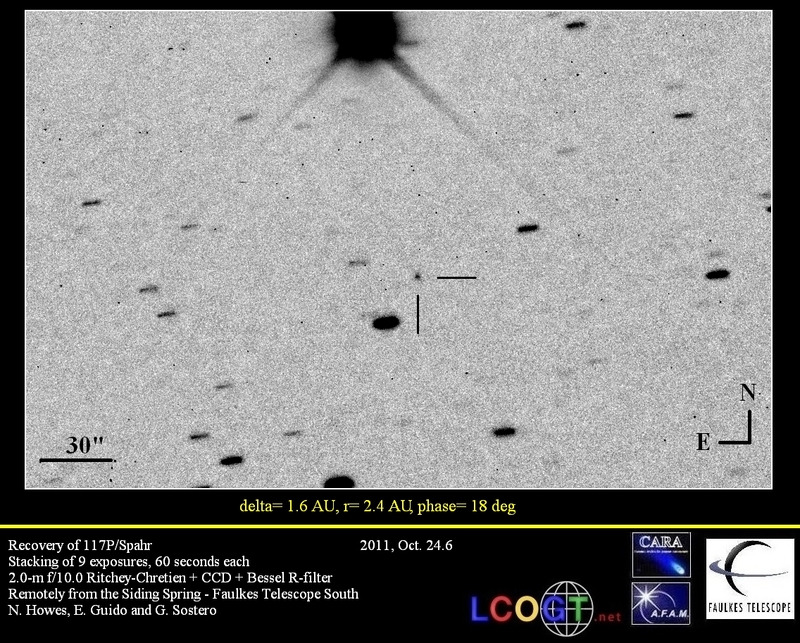 Below you can see the discovery images of 2018 LA (also known by it provisional NEOCP designation ZLAF9B2). 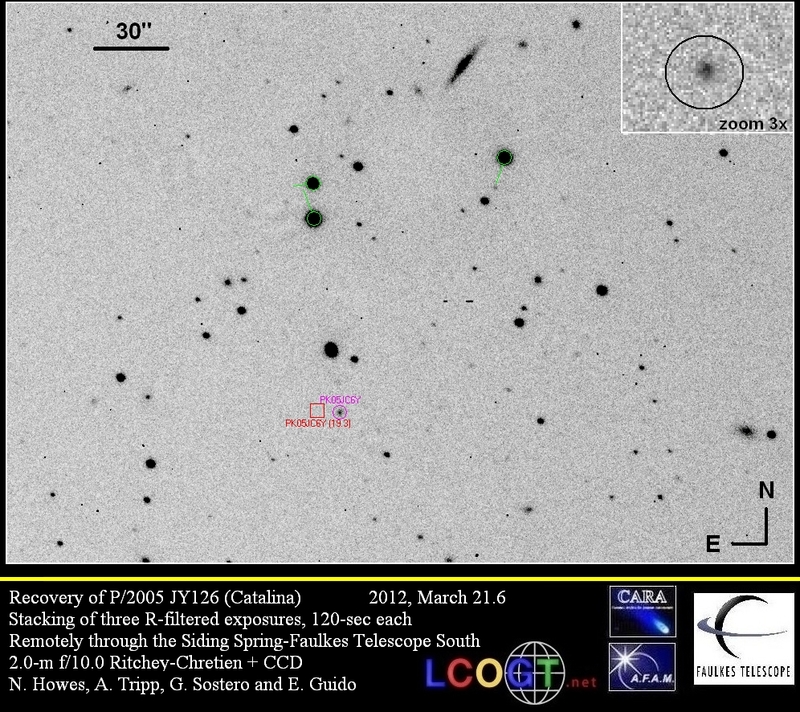 The asteroid is the streak just at center of the image, surrounded by the purple circle. (CREDIT: Mt. 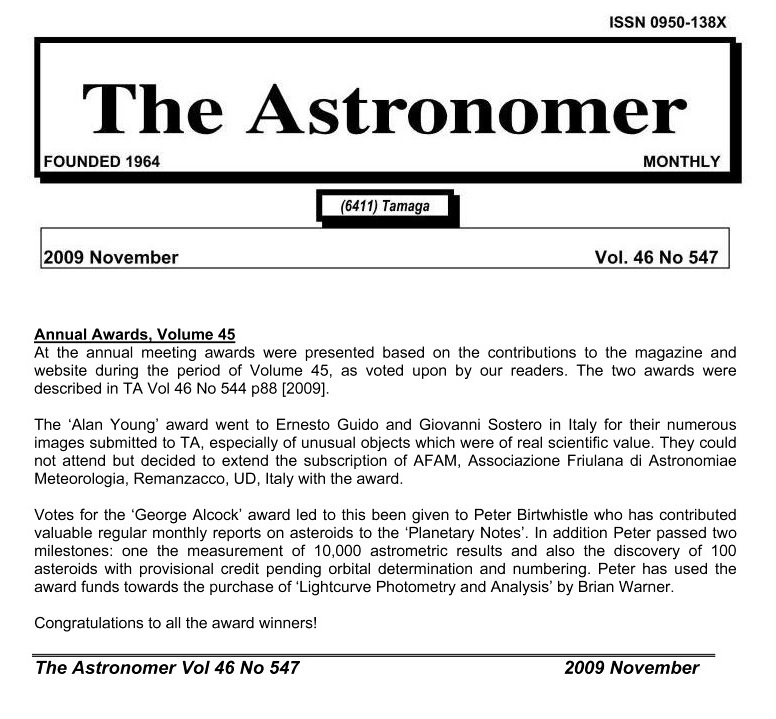 Lemmon Survey - CSS). Below you can see the a map of the possible impact region made by Bill Gray (click on the image for a bigger version). The corresponding impact times and locations are listed here. 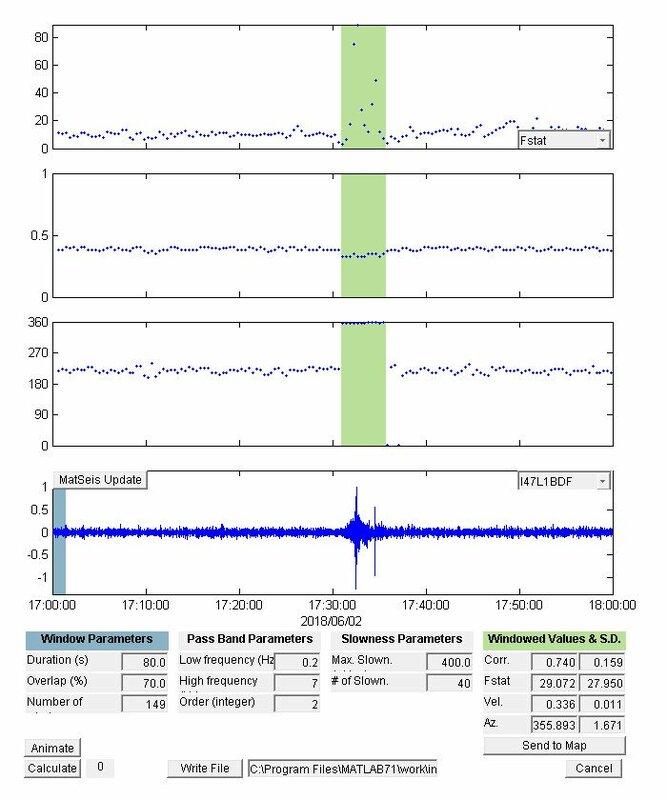 The yellow circle and X in Botswana mark the lat/lon from the AMS reports (see below). 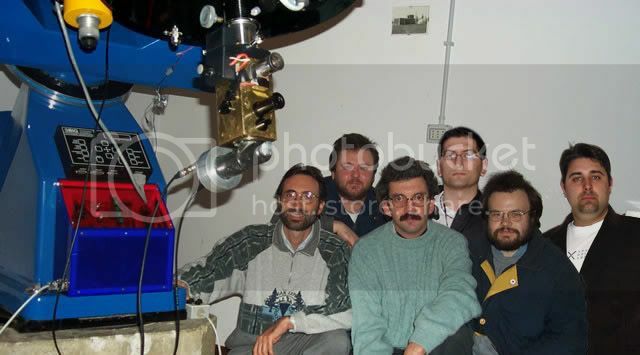 According to Bill: "The object came in at about altitude 16 degrees above the horizon, at azimuth 98 degrees (a little south of due east). The magenta dots on the plot are again for impact on an airless planet; the actual impact ought to be quite a bit to the east. Which matches the impact reports nicely" and "The magenta impact points run from the Atlantic most of the way through northern Namibia, which is just south of Angola. Shifted eastward after allowing for the fact that the object was presumably seen in the upper atmosphere, they'd move into Botswana." To date American Meteor Society (AMS) received 8 reports possibly related to entry into the Earth's atmosphere of 2018 LA about a fireball seen over South-East District, Gauteng, North West and Northern Cape on Saturday, June 2nd 2018 around 16:45 UT. In particular one of the reports by Barend Swanepoel contains a video showing the fireball as seen from between Ottosdal and Hartebeesfontein North West South Africa. (another video related to this event and submitted to AMS is visible here ; see also this CCTV camera record from Kuruma Radiators, note that in this video camera time is about 26 minutes behind). 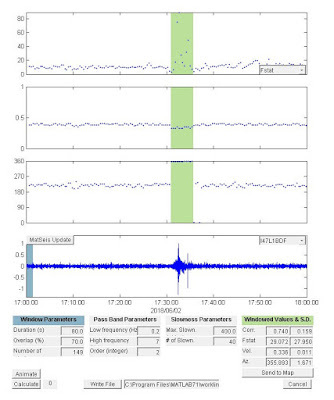 According to Peter Brown: "Strong infrasound detection of a bolide at station I47 in South Africa today at 1730 UT. 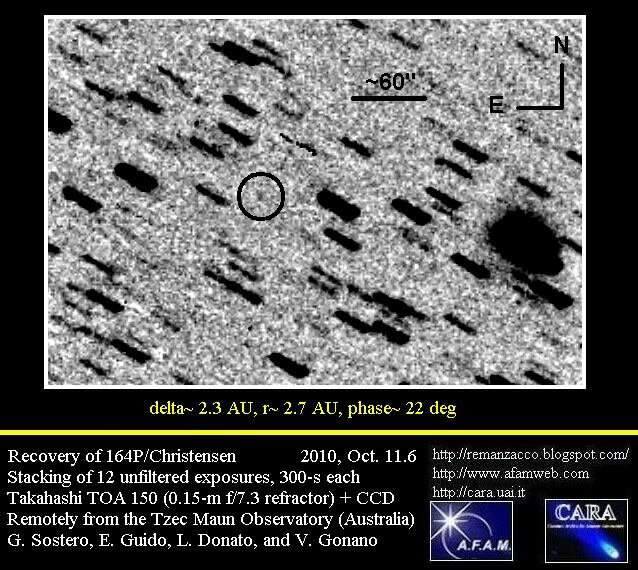 Origin time between 1645-17 UT over Botswana. 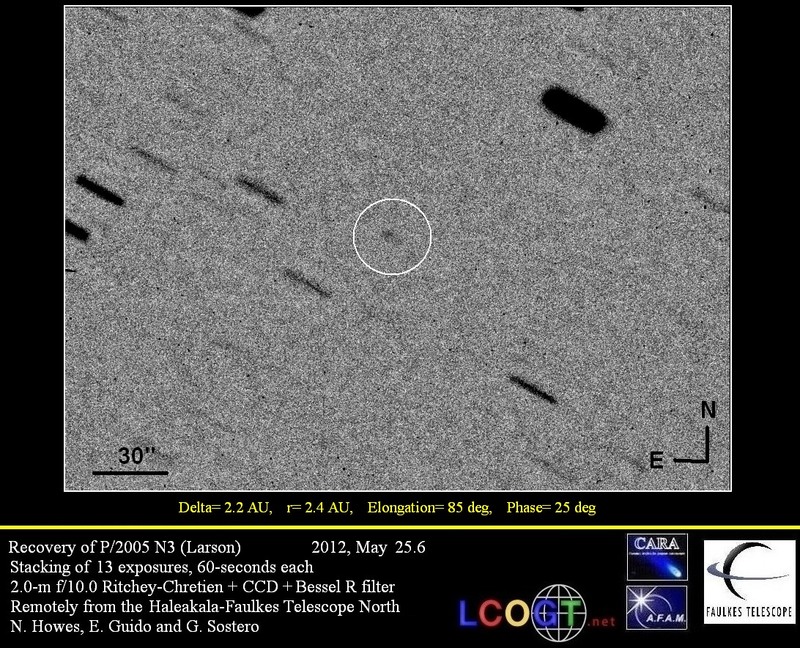 Yield 0.3-0.5 kT, corresponding to 2m diameter asteroid". 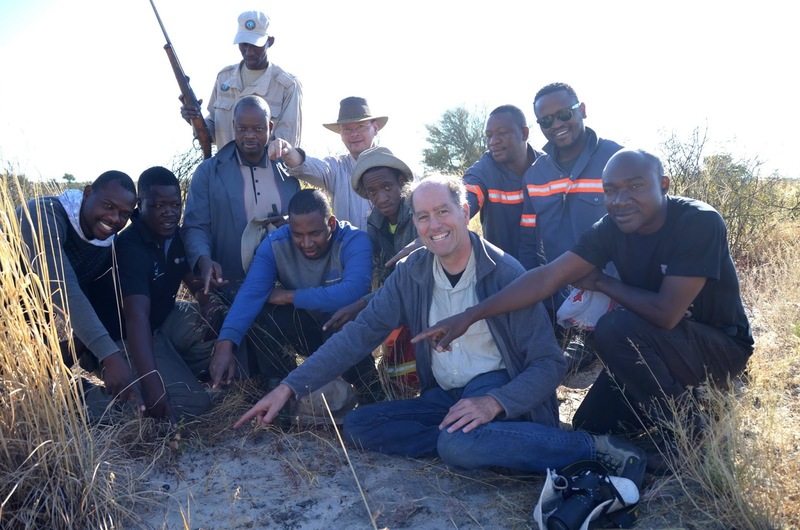 On Saturday, June 23, 2018, after five days of walking and scouring around a team of experts from Botswana, South Africa, Finland and the United States of America recovered a fresh-looking 18-g meteorite in Botswana's Central Kalahari Game Reserve (CKGR). 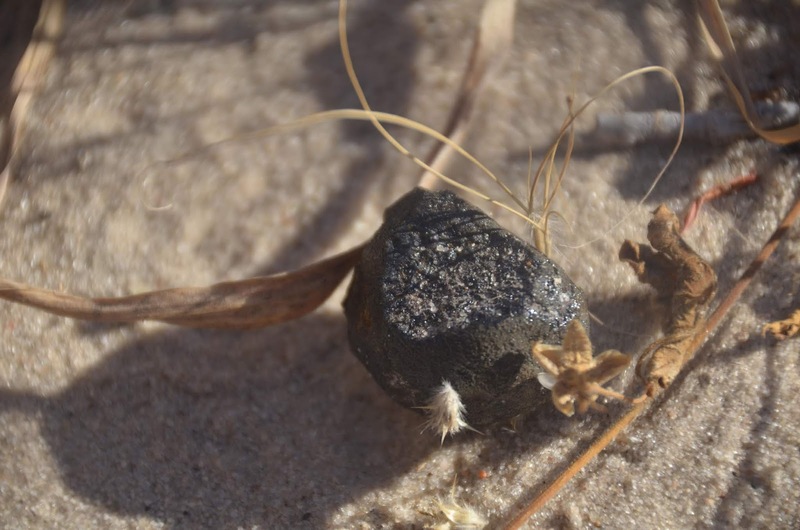 The meteorite is one of the fragments of asteroid 2018 LA which collided with Earth on June 2, 2018 and turned into a meteor fireball that detonated over Botswana a few seconds after entering the atmosphere. This is the third time in history that an asteroid inbound to hit Earth was detected early and only the second time that fragments were recovered. 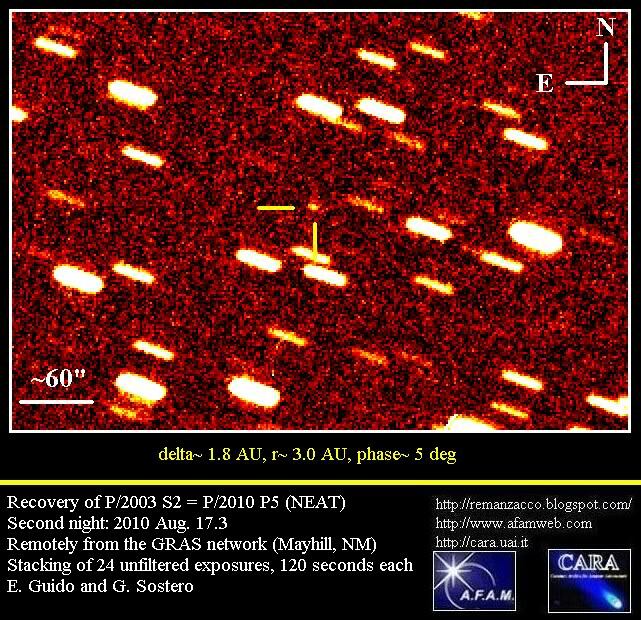 After disruption, the asteroid fragments were blown by the wind while falling down, scattering over a wide area. Calculations of the landing area were done independently by a US-based group headed by Peter Jenniskens, a subject expert of the NASA-sponsored SETI Institute in California, as well as Esko Lyytinen and Jarmo Moilanen of the Finnish Fireball Network (FFN).